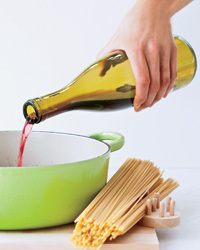 F&W’s Grace Parisi scores half-empty bottles of wine after staff tastings, then uses them in her cooking adventures. 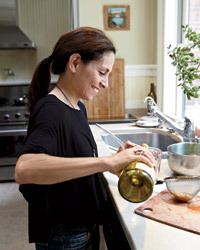 F&W’s Grace Parisi loves cooking with wine.Photo © Lucy Schaeffer. One of the great perks of working in F&W’s Test Kitchen is taking home half-empty bottles that our wine gurus Ray Isle and Megan Krigbaum have just sampled in the Tasting Room. Ours is a perfectly symbiotic relationship: Ray and Megan haven’t bought lunch, and I haven’t bought wine, in years. More often than not, the wines are quite good and out of my price range (as is lunch in midtown Manhattan). Usually the bottles have several glasses remaining, which is more than enough for a quick braise or pan sauce. Or I might use the wine to poach fish: I’ll cook salmon in Riesling, then mix the liquid into a vinaigrette for a delicate salmon salad with butter beans and escarole. If there’s any wine left over after that, I pour it at the table—a reminder that the best wines to cook with are also the most delicious to drink.